Seeing as Sonic Masala is ensconced in the sunny state of Australia (at least for the time being), and also seeing as Brisbane is technically my hometown, it makes sense that I would push the local music scene to breaking point and beyond. We have always had an interesting scene here, even though it has ebbed and flowed in terms of quality, yet never has it been anything less than engaging. 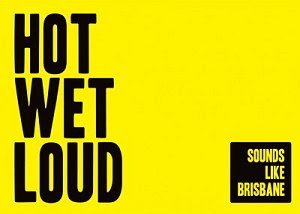 Sounds Like Brisbane is a project aimed at promoting and supporting the independent record labels that are the backbone of the music scene here. The aim of this project is to not only promote the incredible work done by Brisbane's indie labels, but promote their artists to the world. Brisbane has always had a strong DIY approach to music and without the efforts of indie labels and their bands, the music scene here (like just about everywhere else) just wouldn't be the same. These labels make sure great music gets heard. So Sounds Like Brisbane has put out a 17 track sampler from most of the labels under this creative hub umbrella, showcasing much of what we have to offer here, covering all genres. I strongly suggest you check out the website - there are some amazing bands connected to these labels, and some that havent made this sampler (Nova Scotia, Turnpike, Tiny Migrants and Pastel Blaze are great bands that havent made the cut that really should be heard - and there are many many more!) Here are the list of labels - go for a search and find your new favourite Brisbane band!